An enterprise project partnering WeWork with Airbnb. 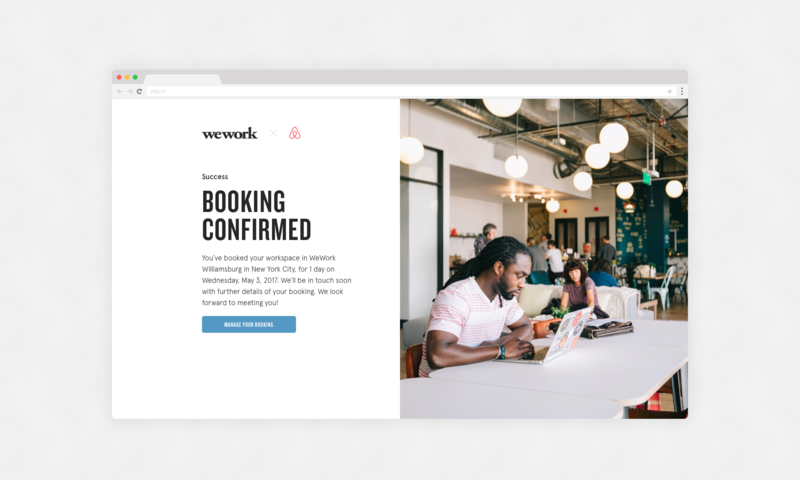 The partnership involved Airbnb identify guests who are travelling for business and offer them the opportunity to additionally book workspace in a WeWork workspace close to their Airbnb. The customer provisionally books on Airbnb, and are then ported over to WeWork to register and manage their booking. 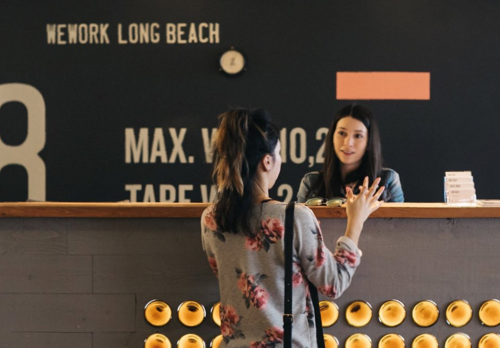 Before this project, WeWork only offered month-to-month membership plans for workspace and private offices — there were no systems in place to manage limited stay guests. 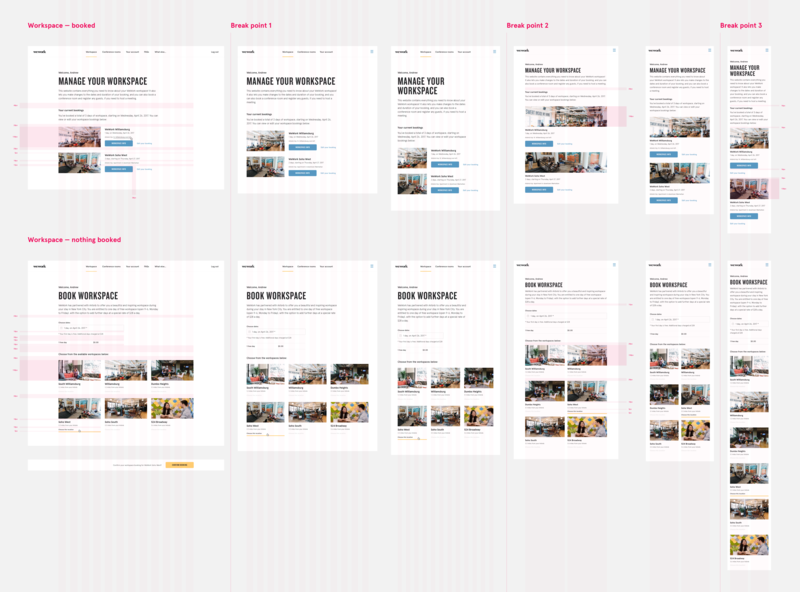 So not only was this project a large behind-the-scenes engineering effort, we also wanted to design a seamless, end-to-end product experience to welcome Airbnb guests to WeWork, and to manage their stay. 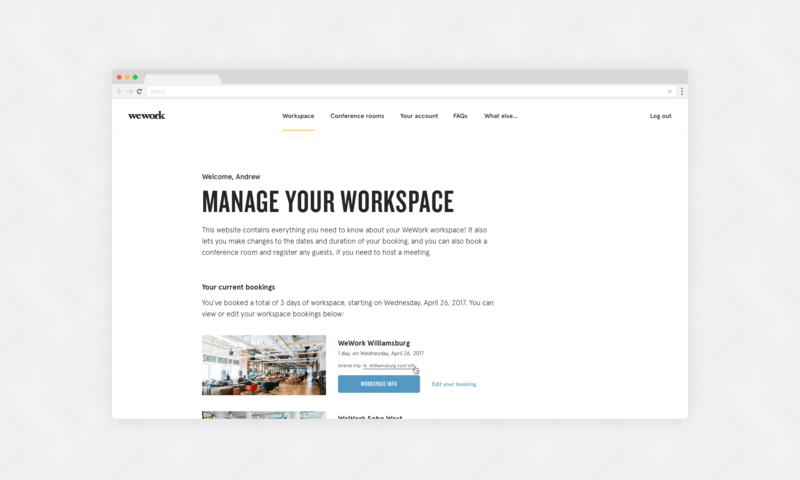 Normally, provisional WeWork members search for workspace and book a tour on the companies core marketing website. Paperwork, payment and terms are managed separately. 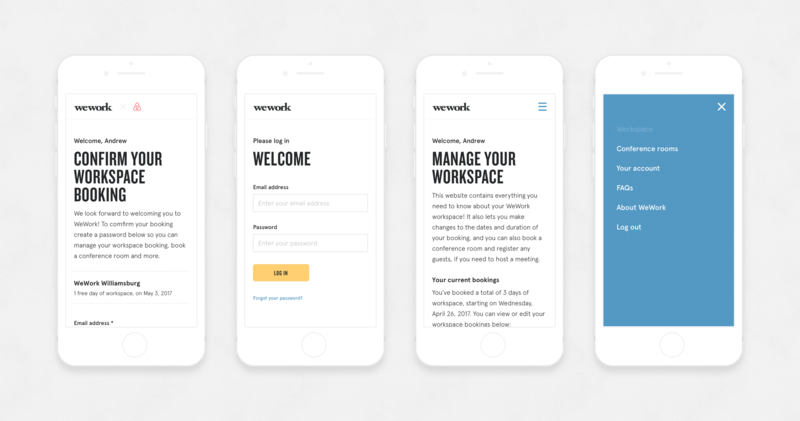 And on their first day in their new workspace, they are introduced to the WeWork Member Network app, where they have access to all the information they need. The timeline is spread out over days/weeks. The digital product flow of this new transient guest type is very different. 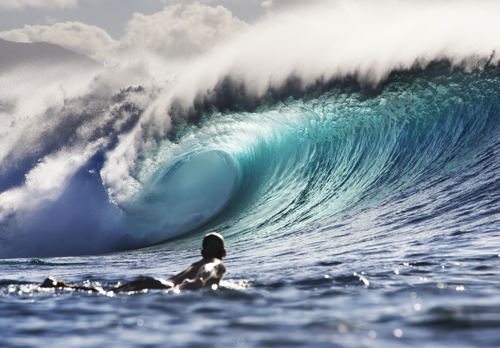 The whole process needed to take as little as minutes, end-to-end. 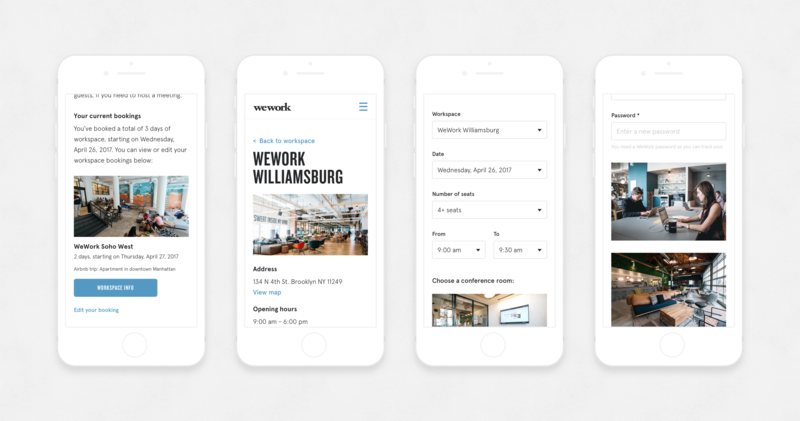 A complete re-think of the process and experience needed designing, for ease of use, and to create the best possible first brand experience of WeWork, for the Airbnb guest. 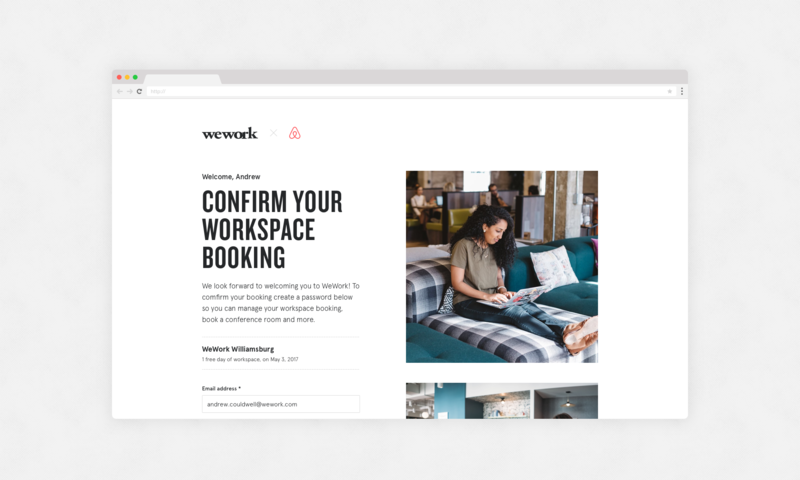 My task, working with Nick Mourgue (Product Manager) was to design and creatively direct the end-to-end experience on the WeWork side of the guest's booking experience. 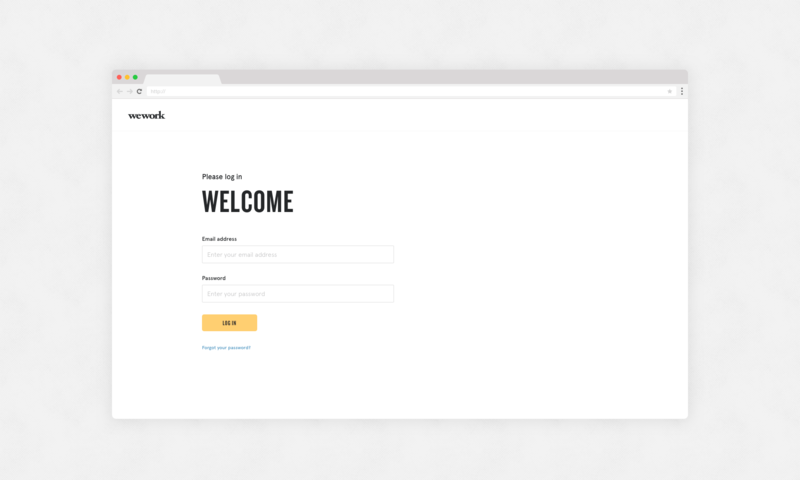 Namely, an online responsive product starting with a simple registration process, through to a password-protected portal to manage their booking, book extras and learn about their workspace. 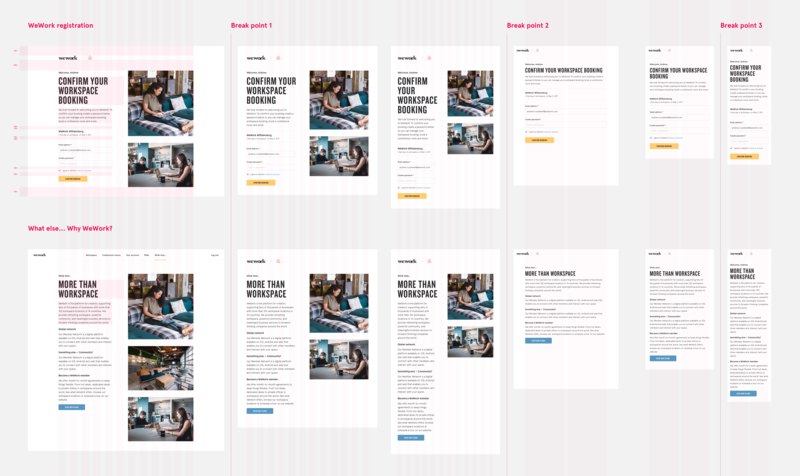 This project was designed with, and further stress-tested a new design system in the works (see the Rivendell design case study). It was also built on the digital brand foundations I was working on in-tandem.